Deluxe Official Bane Costume includes Jumpsuit (with muscle chest), Mask, Belt & Gauntlet - from ‘The Dark Knight’ Film. This deluxe Bane outfit is inspired by the outfit worn by Tom Hardy in ‘The Dark Knight Rises’ film and officially licenced – a dramatic villain outfit for any fancy dress occasion! This costume includes everything you need to become this fantastic character with jumpsuit (with moulded muscle chest), mask, belt and gauntlet. 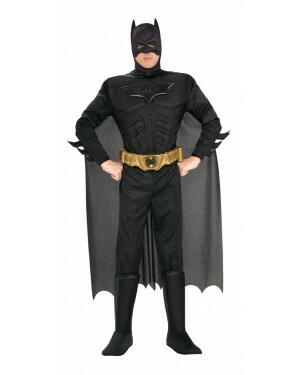 The deluxe jumpsuit has a detailed moulded muscle chest and knee pads to create an armoured design, as pictured. The rest of the material is soft and lightweight. A matching moulded belt, gauntlet and mask perfectly complete the look. They all have great detailing to create a really deluxe costume! Large: Chest 40” to 42"
Official Bane Costume which includes jumpsuit, mask, belt and gauntlet.